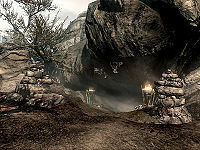 Movarth's Lair is a small cave north of Morthal inhabited by vampires. There is an exterior zone, and one interior zone to the cave, which is separated into a number of rooms. The vampires in this cave are conspiring, under Movarth Piquine's leadership, to enslave Morthal. There are also a number of unnamed corpses being buried in one of the outer rooms. A twisting path runs all the way from the north side of Morthal to the cave. Laid to Rest: Investigate a tragic house fire, and discover an insidious plot against the town. There are two bleeding crown plants in the entrance, one of which can only be picked by approaching the brazier—any further and the entry trigger is tripped. There is a skull on the stones to the left. The tunnel leads to a wooden platform over a room with two spiders. There is a walkway to the left that leads downwards. There is nothing else of interest, except the dark tunnel to the south which leads to another room. Up ahead there is a vampire's thrall sitting at a table with a lantern. Around the thrall, along a short twisting path, is a small room with three carts filled with the remains of a few people, and an imp stool growing in the middle of the room. There is a hole in the rock wall to the left, but too high to reach. The path deeper into the network of caverns is to the north of where the vampire's thrall sat. Another low-level vampire is working in this room, burying corpses in a hole in the northwest portion of the room. There are three piles of rocks around the room littered with remains too. There is a table to the left from the entrance with some generic clothes, another to the right after that with more generic clothes, and a bleeding crown growing at the base of it. By the western wall there is a cart and a table with more clothes. By the table there is a pickaxe, a barrel with a minor potion of health, and beyond that a bleeding crown. The corpses of three Nords and a Redguard lie in the hole, and the only thing of note is that the Redguard carries a lockpick. Lastly, on the other side of the room, there is a bedroll and another bleeding crown. The next tunnel splits into a higher and lower pathway. The higher path is bridged with wooden planks and there is an iron ore vein in the wall. It leads around the wall to a bedroom of sorts. The lower path leads to the main chamber where the master vampire and one of his followers are feasting. If stage 100 of the related quest has been reached, the former will be Movarth Piquine; otherwise it will be a generic vampire boss. There are three other branches from the main chamber, one to the northeast (where you can find the second iron ore vein), one to the east, and one to the south. There is a vampire in the tunnel to the south, and one in the northeast tunnel that will detect any hostilities in the main room, and rush to their master's aid. There isn't much in the main room. The table is covered with food and drink, with a fair bit of loose gold. There are also some remnants of their victims, clothes, armor, bones, etc. There is also an enchanter's potion in the middle of the table. Lastly, there are two Namira's rot growing between the table and the southern tunnel. The tunnel to the northeast leads to the other side of the bedroom area that the higher wooden path lead to. There are two imp stools growing in the northeast tunnel. The room is split in two, one part with a single proper bed, and another with three bedrolls. By the single bed is a copy of the Illusion skill book 2920, Sun's Dawn, v2, Movarth's boots (which provide a 15% sneaking bonus), and a shelf with a large assortment of boots (which includes a pair of Imperial light boots and a pair of Stormcloak officer boots). The only thing of note by the bedroll is a potion of stamina on a dresser. Behind Movarth's throne in the main chamber is a wooden ramp to a small room with another vampire. There is an alchemy lab here, along with a chest, and a potion of magicka and a copy of Immortal Blood, a book about Movarth, on a set of shelves. The tunnel to the south leads to one final room. There is a vampire on the platform to the right. To the left is a wooden platform with a bedroll, a chest, and a leveled magicka poison. At the top of the stone ramp is another imp stool, and there are a few leveled arrows on the cobweb-covered table. There is a tunnel to the right that leads to the opening above the area with the three carts filled with remains. Alva will appear in the bedroom area of the caves, if you have not killed her during Laid to Rest. She is a non-hostile vampire, and will defend herself against any of the other vampires that attack her. 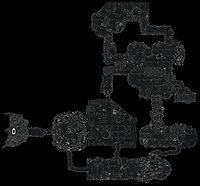 Movarth's Lair cannot be set as cleared on the map, as none of its inhabitants have the "Boss" Loc Ref Type. This bug is fixed by version 1.3.2 of the Unofficial Skyrim Patch. A crash may occur when approaching this lair for the quest Totems of Hircine. ? This page was last modified on 23 November 2017, at 17:48.